Hi. I recently inherited this cameo ring and I'm struggling to match the makers mark with the date. I think the date stamp relates to 1801. It has a birmingham stamp the makers mark looks like S H. Can anyone shed any light? You are far more likely to get responses if you embed your images as very few people will click on thumbnails or links. 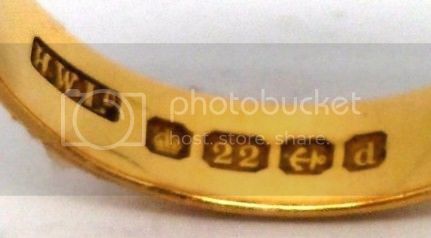 It`s Edwardian 22ct gold, Birmingham 1903. Is the maker ‘’SH’’? Cannot identify it. Date letter ``d`` script can be confusing because of different backgrounds depicted elsewhere in Birmingham silver date letters. This is another example of the mark for 1903 (different maker). Hi thanks for the info. The makers mark is SH I think although the s is a little worn I'm sure it's an s.
Right, Trev, must be Samuel Hope. Another example of SH mark. 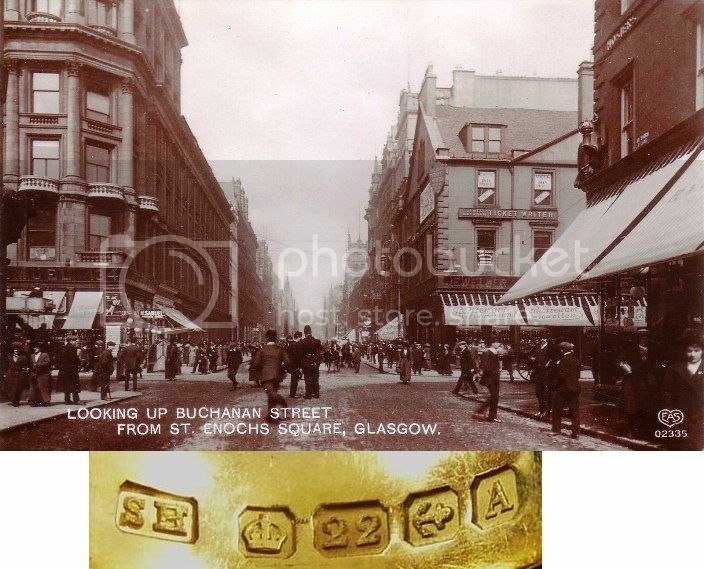 Jewelers flank the entrance to Buchanan Street in this view taken around 1912 from the entry to St. Enoch Square. On the left, Samuel Hope occupies the ground floor corner of the Stewart & MacDonald building and on the right two jewelers, Robert Scott and Robert Stewart, have premises in the former mansion. Robert Stewart held the distinction of having been appointed Goldsmith, Silversmith and Jeweler to Queen Victoria. These jewelers would set the tone for the upscale nature of much of the business conducted in Buchanan Street. Thanks that looks like the stamp I've got. I didn't think it could have been samuel hope when I was ked to believe the date stamp was 1801 but 1903 is in the right period. I think there may be an error in that script. 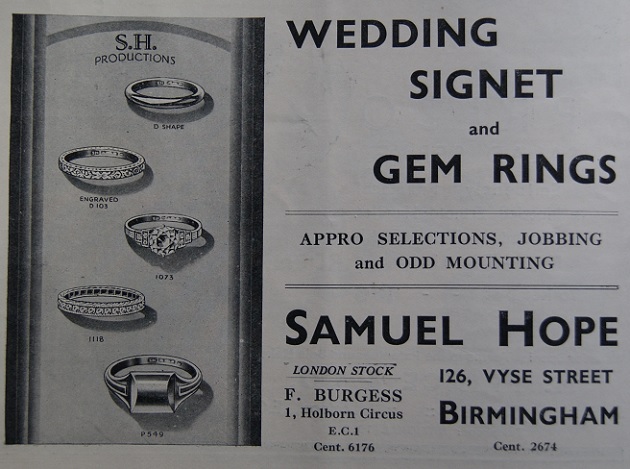 The business referred too was that of the retail jewellers, H. Samuel, not Samuel Hope. Yes, I was wondering why family name came first, but now I see that there is H.Samuel.